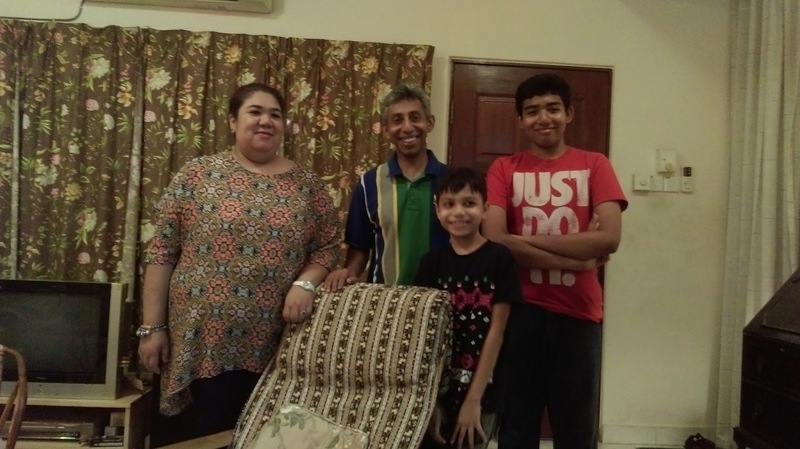 Jailani and Irene, my 'two middle aged' youngsters from Singapore braved an eight-hour bus journey from Boon Lay (Singapore) to Setiawangsa for an overnight stay last weekend. What a lovely sight it was - to hear Salam Aleikum from these two faces peeping over our gate - clutching a brown paper bag. On opening the gate we got hugs and kisses that reeked of hot pisang goring that they had bought from the Abang Goring Pisang at Setiawangsa LRT Station. But their capacity for sharing was quite commendable. " Have some pisang goring - it's really yummy," said Irene to Uncle and Miss Hamid! What more could we ask for eh?? I know this blog is almost comatose. Like the parrot in Monty Python's sketch, Ash is not "quite dead, demised, passed on, ceased to be, bereft of life, not quite pushing the daisies". AsH is "resting, stunned and pining" buffeted by the winds of a Kafkaesque bureaucratic drama in the land of my father, my grandfather, great grandfather, great great-grandfather and perhaps right into the ooze and slime of the origins of life on earth. At times all I can appreciate in my Tanah-Air is the Tanah and the Air. Anything else (other than the wildlife) is pathetic and oppressive. It has worn me out - wafer-thin. Well, Jai and Irene were like a breath of fresh air ( and the aroma of pisang goring). Not only that, they (especially Jai) nagged and tormented our dear neighbour - Zarina and Ken - for "ikan tiga rasa" and Aik Cheong kopi O! We call such Singaporeans kaki menginding. Jai has polished this very fine art of mooching (like our cat Rusty) with us when he was a student in Glasgow - hinting at roast chicken with stuffing, sambal pedas ikan goreng and acar ikan kurau. Zarina succumbed to the harassment and here are two very happy Singaporeans and the two diddies. And just the night before they gave us really succulent Satay from AU3! Smiles and Smiles of Food! This included a bonus dish of Kurma Ayam. Here they are: our long-suffering Zarina and Ken and their two boys Haiqal and Daniel. Jai has invited Zarina and family to stay with him whenever they visit Singapore. We know Jai is a very hospitable host. Zarina will have full use of his kitchen and Irene will prepare the Menu for each day of their stay. I must say I felt so much better after this weekend because I can now paint six wonderful people onto the landscape of my Tanah-Air. Thank you all. Last, but not least there's Lely. One day Lely, one sweet day, we will revive those halcyon days at Setiawangsa - to a Setiawangsa "cluttered with books and buffered by greenery" , according to Jai. You are always here , in spirit - with us.